Most current analysis on Latin American politics has been directed at examining the shift to the left in the region. Very little attention, however, has been paid to the reactions of the right to this phenomenon. What kind of discursive, policy, and strategic responses have emerged among the right in Latin America as a result of this historic turn to the left? Have there been any shifts in attitudes to inequality and poverty as a result of the successes of the left in those areas? How has the right responded strategically to regain the political initiative from the left? And what implications might such responses have for democracy in the region? The Right in Latin America seeks to provide answers to these questions while helping to fill a gap in the literature on contemporary Latin American politics. Unlike previous studies, Barry Cannon’s book does not simply concentrate on party political responses to the contemporary challenges for the right in the region. Rather he uses a wider, more comprehensive theoretical framework, grounded in political sociology, in recognition of the deep social roots of the right among Latin America’s elites, in a region known for its startling inequalities. Using Michael Mann’s pioneering work on power, he shows how elite dominance in the key areas of the economy, ideology, the military, and in transnational relations, has had a profound influence on the political strategies of the Latin American right. He shows how left governments, especially the more radical ones, have threatened elite power in these areas, influencing right-wing strategic responses as a result. These responses, he persuasively argues, can vary from elections, through street protests and media campaigns, to military coups, depending on the level of perceived threat felt by elites from the left. 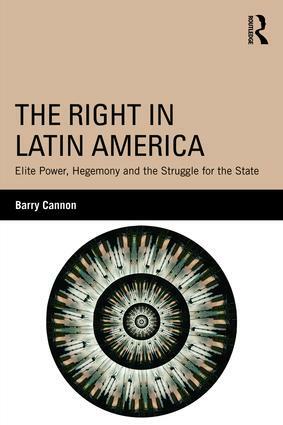 In this way, Cannon uncovers the dialectical nature of the left/right relationship in contemporary Latin American politics, while simultaneously providing pointers as to how the left can respond to the challenge of the right’s resurgence in the current context of left retrenchment. Cannon’s multi-faceted inter-disciplinary approach, including original research among right-leaning actors in the region makes the book an essential reference not only for those interested in the contemporary Latin American right but for anyone interested in the region’s politics at a critical juncture in its history.